Though we specialize in sushi, here at Nikko Japanese Restaurant we love all Japanese food, and in today’s blog, we are going to talk about some of our favorite dishes. If you are in the Charlotte area and in the mood for some seriously good sushi, pay us a visit! 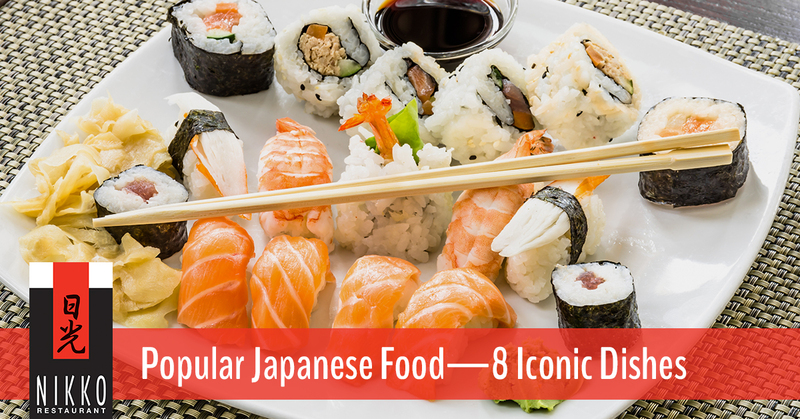 What better Japanese food to kick this list off with than our favorite: sushi. As we’ve surely mentioned in past blog posts, great sushi (すし, 寿司, 鮨) is a work of art. To put it simply, sushi is raw fish, vinegared rice, and toppings. There are a wide array of sushi rolls out there, and sushi bars all over the world are serving up some truly delectable and original rolls. If you are interested in trying some of the best sushi in Charlotte, stop by Nikko Japanese Restaurant! If you ever venture to Japan—and you should!—you will be pressed to not find ramen on almost every street corner. Ramen (ラーメン) is a delicious noodles soup that is not only one of the most popular foods in Japan, but it is also one of the most inexpensive Japanese foods—a pretty awesome combination if you ask us. Additionally, one of the great things about traveling the country of Japan is trying all the regional variations of this iconic dish. Tempura (天ぷら or 天麩羅) is seafood and vegetables dredged in batter and then cooked in oil. It seems like a traditional Japanese food that has been around for centuries, right? Well, not exactly. Tempura was actually a dish that was brought over by Jesuit missionaries from Portugal. These missionaries introduced Japan to the game-changing art of batter frying their fish. Udon (うどん) are thick, wheat-flour noodles. They are slightly thicker than ramen and chewier. All over Japan, there are restaurants specifically devoted to making udon. These restaurants serve up udon hot, cold, with and without soup, and sometimes with meat, vegetables, and eggs. This is also one of those dishes where it is mandatory to make a loud slurping sound when eating—it’d be rude not to! Not only is shabu-shabu (しゃぶしゃぶ) a dish that is fun to say, but it’s also insanely delicious. This Japanese style hot pot allows you to drop slices of meat, seafood, vegetables, tofu, and other ingredients you crave into a near-boiling hot soup. Fun fact: the onomatopoeia name actually comes from the sound the thin slices of meat make when being swished around with chopsticks in the broth. Part pancake, part pizza, part omelette, part…something that’s totally original, okonomiyaki (お好み焼き) is a classic Japanese food. Though it is most popular in the cities of Hiroshima and Osaka, it can be found all over Japan. In some okonomiyaki restaurants, you can even find large hot plates that have been built into the table, allowing patrons to prepare their own okonomiyaki—don’t worry, they won’t let you ruin your own meal. Like hambaga, tonkatsu is another one of those dishes whose origin dates back to 19th century, Western influence. Tonkatsu (豚カツ) is pork cutlets that have been breaded and deep fried. Though it has a European origin, the attention to detail and ingredients give it an original Japanese food feel. It is often served with miso soup and a side of cabbage. If you ever get a chance to travel to Kagoshima, be sure to try the kurobuta tonkatsu—it could change your life. It seems like every culture has some version of meat on a stick. Japanese food is no exception. Yakitori (焼き鳥) is skewered grilled meat, often chicken, that has been seasoned, sauced, and grilled, often over charcoal. It’s simple, tasty, and universally loved. However, it is important to note that yakitori is often made using all parts of the chicken, so if you are adamantly opposed to eating gizzards, skin, organs, and other not-so-popular parts, be cautious of this dish. We hope that this blog has expanded your understanding of Japanese food and maybe even inspired you to book a trip to Japan. However, if this isn’t quite feasible and you still have a hankering for delicious sushi and other Japanese favorites, stop into Charlotte’s go-to Japanese restaurant, Nikko Restaurant! © 2017 Nikko Restaurant. Do Not Copy.